A compact shrub with deep green foliage. The new growth is scarlet red, fall color is bronze. 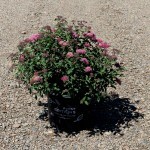 Blooms throughout the summer with pink flowers. 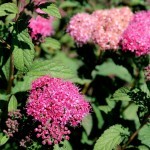 Use in the shrub border, for mass planting, or a low hedge.